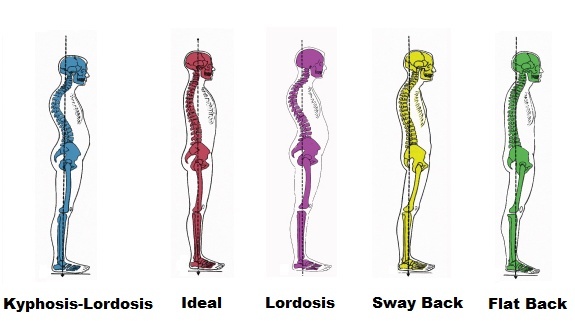 What is your natural spinal posture? Watch, we don’t all work the same. A simple observation of how people walk down the high street will show you this is true. Why is this, well there are many reasons but the individual’s standing posture will be of relevance. Again, observing people standing still to and from the side will uncover one of the five typical postural alignment illustrated below. These alignments are, to an extent, both a natural occurrence but can also represent the result of the postural and lifestyle habits that the person adopts. All of these presentations of standing posture can be considered normal, but our Physios will be aware that some symptoms are more prevalent with certain postural alignments. Thus the bespoke service that our Cardiff Physio Clinics offer will be the most appropriate for you as an individual. If you would like to speak to a Physio about your symptoms and whether Physio with us can help you, please contact us now.